Wish all my readers a very HAPPY TAMIL NEW YEAR..
Soak the almonds overnight and peel the skin. Else soak the almonds in hot water for an hour and peel the skin. Grind the almonds with little milk to a slightly coarse paste and make it ready. Grate the carrots and collect in a bowl. Heat little bit of ghee and fry the carrot for 2 to 3 minutes on medium low flame until the raw smell of the carrot is gone. Later add the ground almond paste , the remaining milk and combine them thoroughly. Add a tbsp of ghee, stir together on a medium low flame. Keep on stirring the mixture for 5 minutes then add the sugar and combine them well. Keep on stirring the halwa more and more until the desire consistency reaches like the halwa consistency. Add ghee little by little in between while stirring the halwa. Add the saffron milk to the halwa and mix well. Stop stirring when the halwa starts leaving the sides and also some white sorta bubble appears when u stir on the sides. Finally add the cardamom powder and mix once again. Remove from the heat and let it cool for some time and serve. 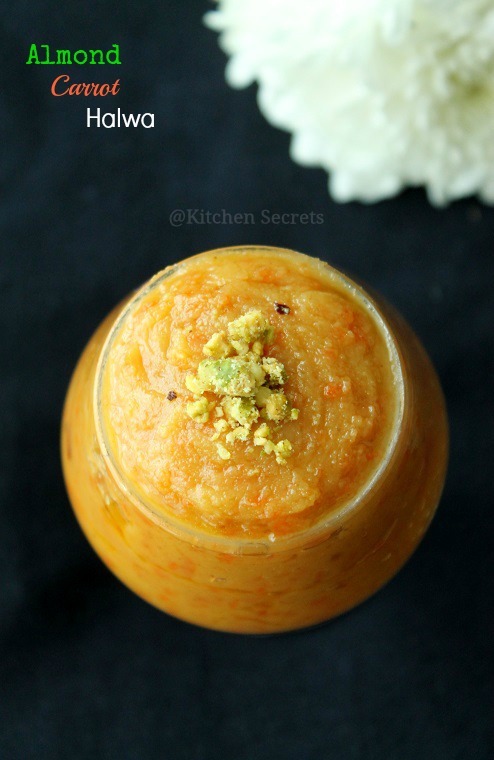 I've used only 1/4th cup of ghee altogether to make this recipe. Also I've used 1 cup of sugar only. 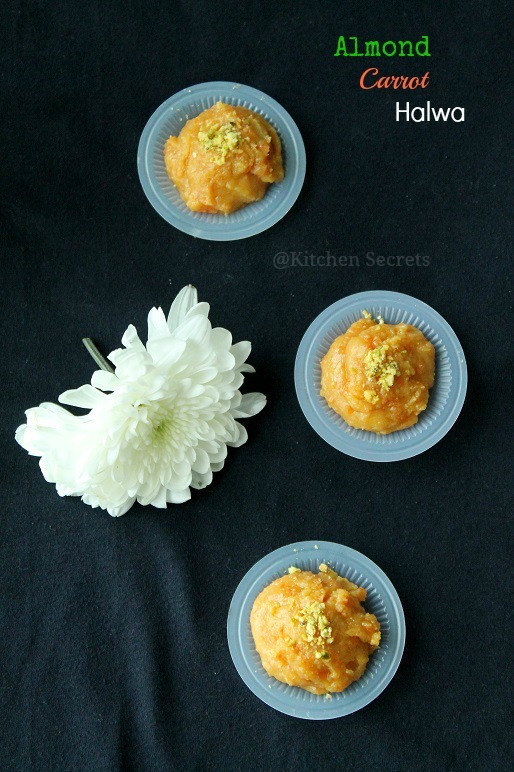 Kindly check out my Almond Halwa post for detailed description. Super tempting halwa,looks absolutely divine and inviting.Happy new year wishes Shobana.. Delicious and wonderful looking halwa. hmmmmmmmmmmm yum yum lipsmacking and tempting halwa. Almond carrot halwa looks delicious shanavi, Wishing you and family a happy and prosperous new year. 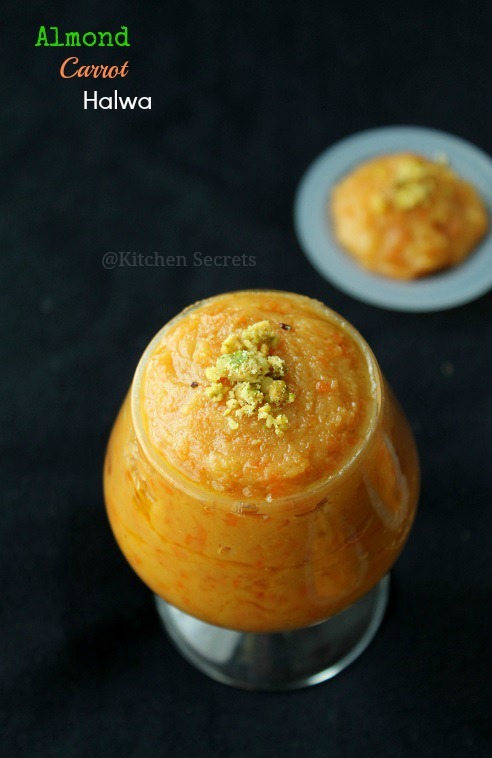 Carrot and almond together in halwa - isnt it fantastic? Lov your pic too. Hi, this is a great post. I wondered if you would like to link it in to the new Food on Friday which is running right now over at Carole's Chatter. We are collecting recipes using carrots and/or leeks. This is the link . I hope you pop over to check it out. There are lots of great recipes already linked in.